This is the first game in the Crash Bandicoot series. 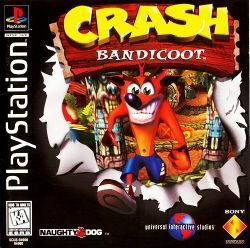 For other games in the series see the Crash Bandicoot category. Crash Bandicoot is a platform game made by Naughty Dog in 1996 for the PlayStation, featuring the character by the same name. In it, Crash must fight Dr. Neo Cortex's henchmen in order to save Tawna, his beloved bandicoot girlfriend for revenge on Cortex. This game was made when Naughty Dog had only ten employees. The game was re-released via the PlayStation Network for the PSP on December 4, 2006. It was later released for the PS3 on May 3rd, 2007. This page was last edited on 2 March 2016, at 01:55.